Last week I attended a METIS project meeting in Barcelona. It was an excellent and productive meeting. We are at an important stage in the project. We have developed an Integrated Learning Design Environment (ILDE), health which brings together the research work we have been doing over the last ten years. 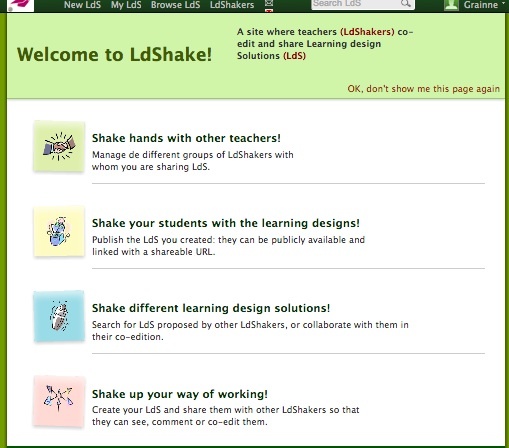 The ILDE covers conceptual design, remedy authoring and actual implementation in a Learning Management System. It is also possible to explore existing designs in the system that others have produced. Designs can be tagged by discipline, malady pedagogy or free search. We had the chance to explore the ILDE and we are planning on running a series of workshops in the UK, Greece and Spain in the Autumn with teachers to evaluate it. The ILDE is available online definitely worth taking a look at! One of the key success factors for a good project is a strong consortium, of people who have a shared vision and know each other’s work. That is certainly the case with METIS. I am looking forward to evaluating the workshops and to finding out how practitioners find the tool and whether or not it is useful. You are currently browsing the e4innovation weblog archives for July, 2013.